One of the biggest reasons why mozzarella is good for you is its high protein content: over 22 g of protein for every 100 g of the fresh cheese. Protein is an essential macronutrient, one on which the immune system in particular relies greatly. Antibodies that are used by the immune system to neutralize pathogenic bacteria and viruses are essentially proteins. Complement proteins mostly synthesized by the liver and some white blood cells also participate to the immune system response by activating various white blood cells and triggering inflammation to activate the immune system. Eating protein is thus essential for good immunity because it actively supports the immune system in its fight against infection and disease. And what better, simpler, fresher option than mozzarella. Mozzarella is also a moderate source of zinc, providing 2.92 mg of zinc for every 100 g. An average adult on a 2000 kcal diet requires about 11 mg of zinc a day, so about 100 g of mozzarella alone provides somewhere along 20% of the recommended intake of the mineral. The fresh cheese variety further provides 170 mcg (micrograms) of vitamin A, which is also about 20% of the RDI for an average adult. Together, zinc and vitamin A in mozzarella help maintain the integrity of skin and mucous membranes, including of the nose, mouth and throat, the most common entry points of viruses and bacteria. A sufficient intake of zinc in particular has been shown to help activate immune system cells like T-lymphocytes and support the activity of neutrophils, macrophages and other types of white blood cells. A deficiency lowers the immune system response and predisposes to infections and disease. Muscles rely on protein just as much as the immune system does. The amino acids that make up protein help build and rebuild muscle tissue, contributing to overall muscle health. Eating foods rich in protein like fresh mozzarella cheese can help you build muscle mass, gain strength and lose fat at the same time. In addition to this, mozzarella is satiating and contributes to weight control. Mozzarella is an important source of protein (22.17 g of protein per 100 g of mozzarella). The amino acids that make up protein help synthesize neurotransmitters for the brain and directly impact cognitive functions (memory, learning, thinking, attention) as well as mood, appetite, sleep and mental health in general. While rich in saturated fats (which are not unhealthy unless consumed in excessive amounts all the time), fresh mozzarella also provides small amounts of healthy unsaturated fatty acids Omega-3 and Omega-6 (0.76 g per 100 g), small amounts of cholesterol (79 mg per 100 g) and high amounts of vitamin B12 (2.28 g per 100 g). While Omega-3 and 6 are physically part of the brain’s composition, cholesterol and vitamin B12 make up the protective myelin sheath surrounding the tail of nerve cells. Together, they offer protection against degenerative diseases of the nervous system such as multiple sclerosis. Fresh mozzarella cheese provides excellent nourishment for the brain thanks to its high fat and moderate cholesterol content. With 22.14 g of fat and 79 mg of cholesterol per 100 g, it feeds the brain and helps support cognitive functions, especially learning and memory. Foods like mozzarella that are important dietary sources of fat also help improve and relieve brain fog, contributing to better focus. Vitamin B12 is responsible for the production of red blood cells that transport oxygen to muscles. An insufficient intake resulting in a deficiency can easily lead to anemia with symptoms such as paleness, shortness of breath, fatigue, cardiac symptoms (palpitations, fast heart rate, low blood pressure) etc. Mozzarella is a cheese variety rich in vitamin B12, providing 2.28 mcg (micrograms) per 100 g out of the 2.4 mcg recommended daily intake for an average adult, which is around 95% of the entire vitamin B12 you need in a day. As such, it can efficiently counteract severe vitamin B12 deficiency and associated anemia. Rich in vitamin B12, mozzarella helps combat fatigue associated with a deficiency and anemia and has a revitalizing, energizing effect. The cheese variety is also rich in sodium (486 mg per 100 g), helping raise blood pressure to normal levels (if it was low to begin with). It further contains small amounts of potassium, magnesium and is a generous source of calcium, three electrolytes that help balance blood pressure for a feeling of good cardiovascular and overall health. Lastly, mozzarella is rich in protein, fat and has 299 kcal/100 g, providing satiation and long-lasting energy. Believe it or not, fresh mozzarella is a healthy food to eat during pregnancy first of all because of its high vitamin B12 content. Pregnant women have increased requirements of the vitamin because their bodies need to support the baby’s developing circulatory system and this means vitamin B12 is essential as it is responsible for producing red blood cells. Moreover, the vitamin has a strong revitalizing effect and helps combat fatigue and manage anemia. Eating mozzarella rich in vitamin B12 provides other benefits for the brain and nervous system of both mother and child (example: helps synthesize the protective myelin sheath surrounding the tail of nerve cells), making it a great food during pregnancy. 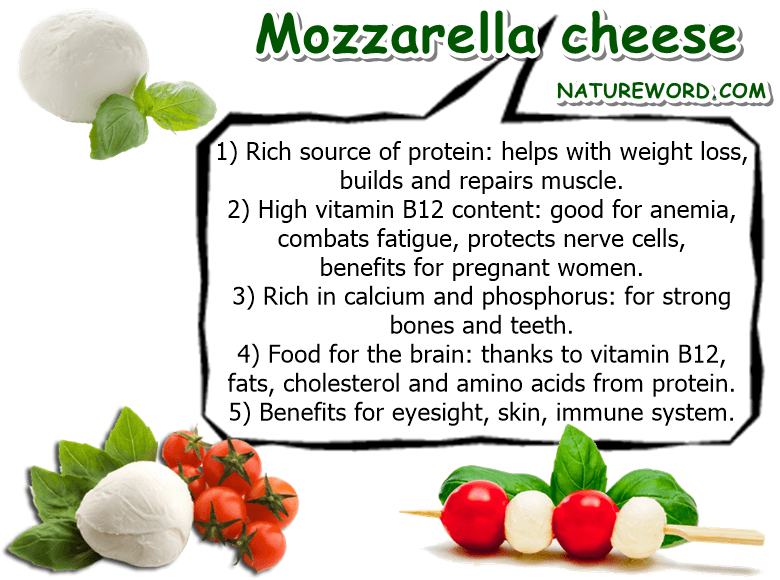 As a generous source of both calcium (505 mg per 100 g) and phosphorus (354 mg per 100 g), mozzarella provides one not so surprising benefit: it helps strengthen bones and teeth and prevents frail bones, osteoporosis and fractures. If consumed in limited amounts as part of an overall healthy and balanced diet, fresh mozzarella cheese is actually good for blood pressure. It contains good amounts of calcium (505 mg per 100 g) and sodium (486 mg) and small amounts of magnesium (20 mg) and potassium (76 mg) , all of which act as electrolytes and contribute to cardiac function by helping regulate blood pressure. If you also drink the whey it’s packaged in (fresh mozzarella is commonly served with or packaged in whey), then you’ll get an extra 161 mg of potassium to further benefit blood pressure. With 170 mcg of vitamin A and 2.92 mg of zinc per 100 g, eating fresh mozzarella maintains the integrity of skin and improves skin appearance. Vitamin A helps immature skin cells differentiate into specialized types and gives skin a healthy looking glow. It has also been shown to benefit dermatitis and other skin conditions as a result of its anti-inflammatory properties and even help delay wrinkles thanks to its antioxidant action. Together with zinc, it helps combat acne and reduce the appearance of acne scars. Mozzarella is not only a good source of vitamin A, but also provides plenty of fat to help us absorb it. So as a source of highly bioavailable vitamin A, it contributes greatly to better vision, both color vision and low-light vision. Vitamin A exerts a strong antioxidant action which provides long-term benefits for retina health and helps maintain good eyesight over time. Also see Properties and Benefits of Mozzarella and other milk and dairy products on our Dairy Page. Like all foods, mozzarella has its benefits and side effects, both determined by how much of it you eat. Given a moderate intake and an otherwise healthy, balanced and varied diet, eating mozzarella can be good for you and provide several surprising health benefits, including better vision, beautiful skin, stronger bones and teeth, enhanced immune function, better memory, less brain fog and muscle gain. Overall, mozzarella is a healthy cheese with a high content of protein, fat, vitamins B12 and A, calcium and phosphorus. Mozzarella vs Burrata: What Is the Difference?